Yes, I have written a book before…. No matter how I try to explain, it always sounds a bit like the opening to Star Wars. “Long ago and far away I wrote another book…” A book that was supposed to be about business but ended up being about life. A book designed to wrap up the end of my business career in one neat and tidy, one hundred sixty-five-page, package. Instead it launched me on the adventure I’m on today. I’d been a financial advisor. A very successful financial advisor. By the end of my career I was the CEO of a company I’d had a hand in founding. My clients were the wealthy and influential. They counted on me and my team to help them make wise choices. And not just with their treasure, mind you but their time and talents too. So, when it came to retirement they wanted more than money in the bank. After a lifetime of success what was next? I can tell you that resting on their laurels was not in the cards. 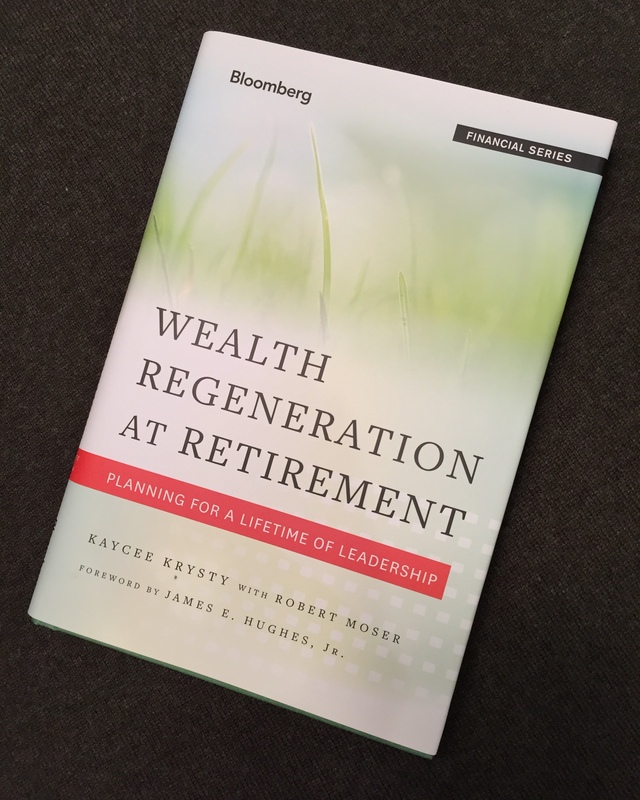 The research I conducted for my clients culminated in Wealth Regeneration at Retirement, published by Bloomberg in 2012. The book is a prescription for finding the way forward to a meaningful third chapter in one’s life. First, I wrote about it. Of course, then I told other people what to do based on it. Then I found it was time to do it for myself. And bingo, look what has happened. What do you care enough about to start an argument over at a very nice dinner party? What in your life do you most want a do-over for? When someone asks ‘what in your life are you most proud of’ what do you say? It is precisely these sorts of question that slap you up the side of the head with what matters most. And isn’t this exactly what the third chapter of anyone’s life should be about? If this could be your last hurrah, why not attend to the things most deeply rooted in your heart? When I started this exploration for myself, crazy things kept popping out. Poetry in 7th grade? Really? My horses sold to the glue factory after my father’s death? Really? What the heck! It was staring me in the face. I had ALWAYS wanted to write books and help animals (but that is another story in and of itself). So here I sit today. Writing romance, with aloha, and horses. Just as it should be. I have never been happier. If you or someone you love is thinking, you might find Wealth Regeneration a useful catalyst. The stories told about high performance people who retire to some sunny place then wither away on the golf course are not urban legends. People of all ages need purpose. Just as much as they need air, food and shelter. That’s what Wealth Regeneration is all about. Here is the link to book on Amazon with a couple of caveats. The book is unabashedly written for hyper successful business people. In today’s world that remains mostly white men of a certain age. Forgive me – that was my market. But the search for late life purpose is universal. The ideas expressed in the book work at any level. And even if you decide the book isn’t right for you, stay tuned. I will be writing more about my own journey and delighted to hear about yours! So let me leave you with one last question. How do you want your own story to end? Yes, it’s an essay question.